It’s time for another installment of Throwback Thursday, people! Now that Fall is in full force and winter is peeking just around the corner, it is time for ALL of the layers! 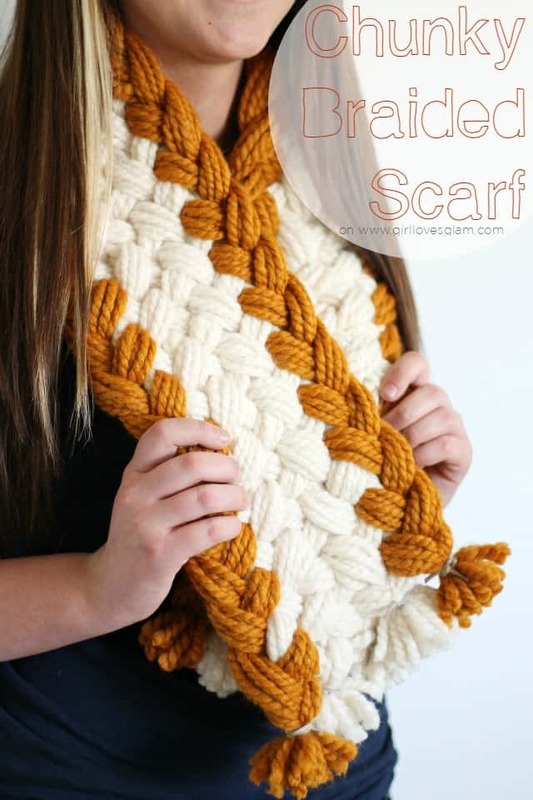 This chunky braided scarf is still one of my most favorite accessories I have ever made. Since I am NOT one to knit or crochet, braiding seemed like the best option for this stellar scarf. As you may be able to recall, I got a really bad eye infection about 6 months ago. It was caused by an old contact case that I used when I was visiting my parents that was full of bacteria. So gross! The eye drops that were used to get rid of the infection created a film over my eyes and it took months to have clear vision again. It was kind of a nightmare, but thankfully I have cute glasses that I totally feel comfortable enough in that I didn’t have to feel frumpy for those long weeks while my eyes healed. Since my eyes are all better now, I am not forced to wear my glasses. However, I choose to wear my glasses pretty often. 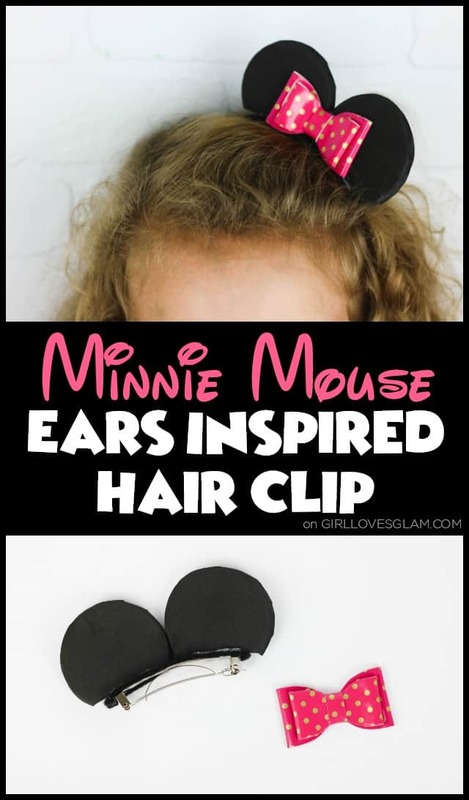 I think they can be a great accessory for my outfits! This is a sponsored post written by me on behalf of Endless Jewelry for IZEA. All opinions are 100% mine. I have collected a lot of jewelry over the years, but very few of those pieces have a lot of meaning. I love how all of my jewelry looks, but when I can find jewelry that looks really good and has meaning it is even better. NYC Travel and Packing Tips and GIVEAWAY! If you follow me on my social media channels, you know that I just got back from an incredible trip to NYC. I have been to New York City three times now and each time has been such a different experience! That is the great thing about New York. Things are constantly changing there, so you can have an entirely different experience each time you go. 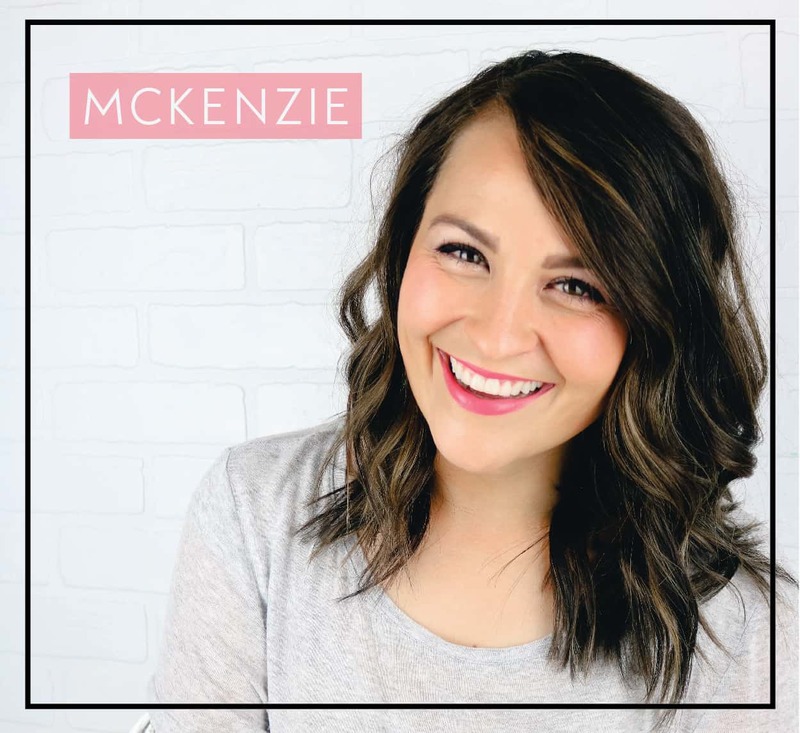 Because I went with my blogger bestie, Holly, things were much more centered around blogging events and fun things that our families wouldn’t necessarily enjoy as much as two moms who were able to escape for a few days. We wanted to get the very most out of the time we had, so we took a red eye flight there. It was my first red eye flight, but I learned a lot! I was really glad I had brought a sweatshirt with me, because the plane was quite cold. 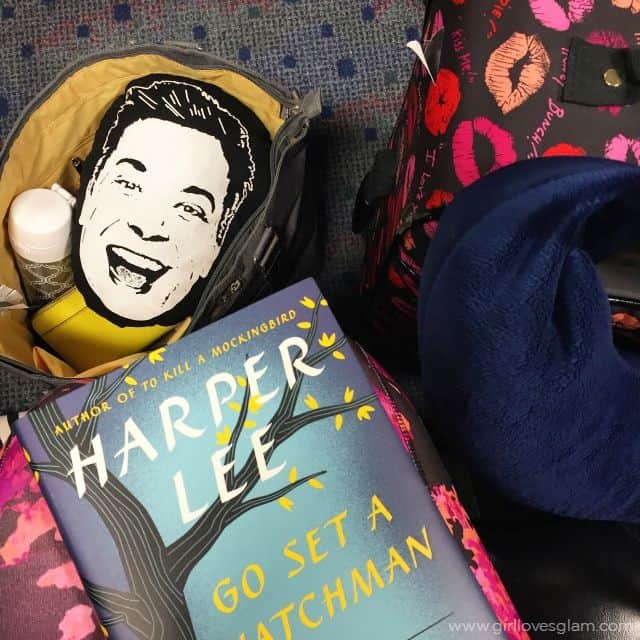 A few things I couldn’t have survived my red eye flight without were my sweatshirt, my travel pillow, a smaller pillow (this one happens to be my Jimmy Fallon face), headphones, tunes to listen to on your phone, comfortable clothes, and a good book. I read my book until I started feeling really tired, put my pillow around my neck, plugged in my headphones, and was able to catch some zzz’s. If you are sensitive to light, I recommend bringing an eye mask. There were a few people who had their reading lights on during the flight and I ended up having to pull my sweatshirt over my eyes to cover the light. The first time I went to NYC, I wasn’t sure what type of purse to bring. I was really worried about someone stealing my purse and taking off with everything in it, so I found myself hugging my purse a lot. The second time around, I only brought a flat wallet with the essentials in it, so I wouldn’t have to worry about a purse. The set back of this was that I was missing a lot of things that I would have liked to have had with me on the go. This time around, I brought my new favorite travel purse, my Baggallini bagg! You probably haven’t seen many pictures of me wearing glasses. I am usually wearing contacts in my photos, but every once and a while I would wear my glasses. 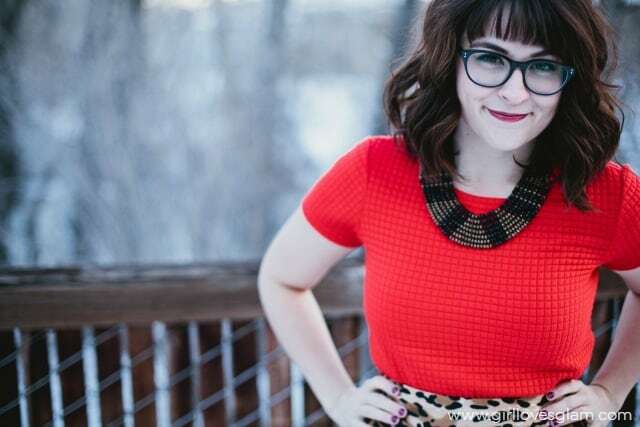 There wasn’t anything wrong with these glasses, but I have been dying to own some bigger, black glasses! I see them all over the place and I love the look of them. I didn’t want fake glasses though. What is the point in wearing contacts with fake glasses when I can get real, subscription glasses for a great price? I love snuggling up in a good, warm sweater this time of year. There is just nothing quite like it! I have been really into sweaters lately in every aspect of life. I love prints that look like sweaters, ugly sweaters, and anything else that may resemble a sweater! 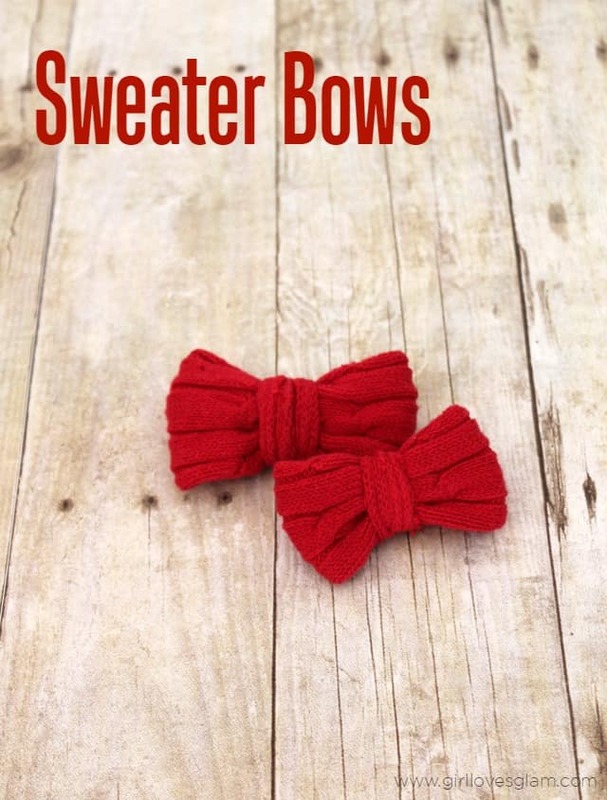 I decided to bring more sweater goodness into my life by making my daughter some adorable sweater bows! I just can’t get enough of my Fall accessories. I love them all! 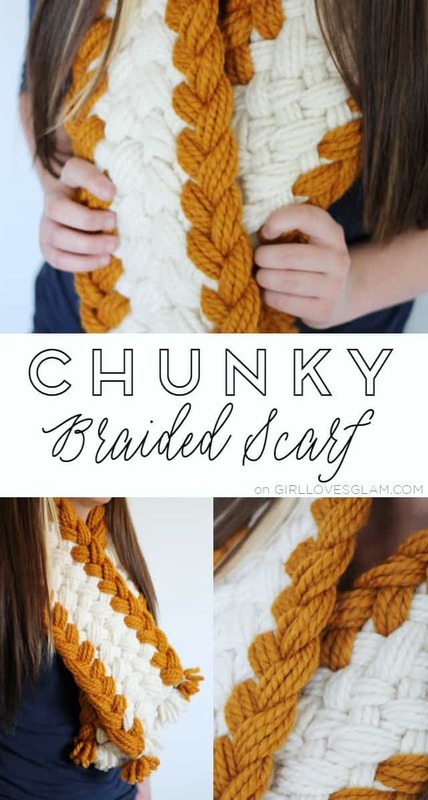 Every once and a while, I get a crazy idea that I can’t get out of my brain and that’s exactly what happened when I thought of this crazy chunky braided scarf. I collaborated with a few of my favorite bloggers to bring you some of the best black and white projects ever! I love classic black and white. Things get even better when gold is involved too. That could be why I am obsessed with this bracelet. 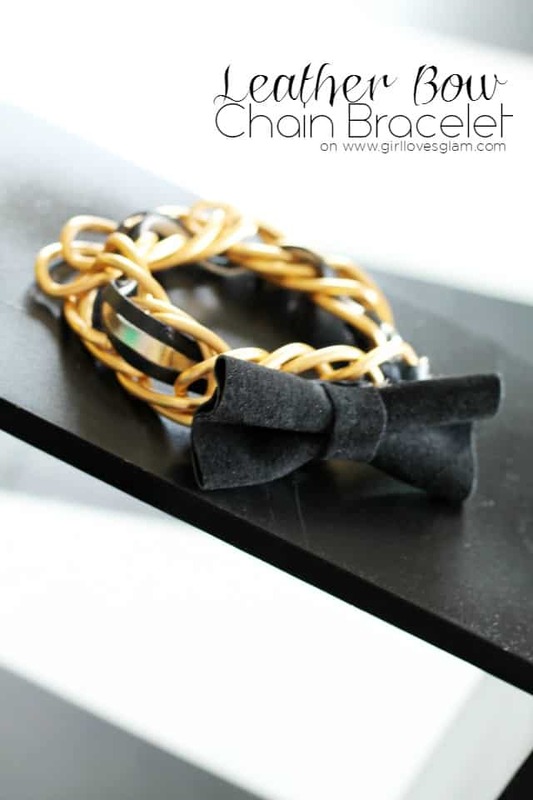 It could also be because it mixes my favorite hard and soft elements too with a leather bow and chain. 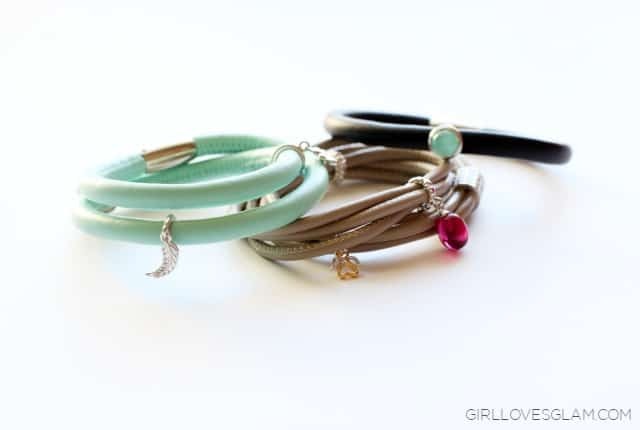 So much goodness in one little bracelet. Instead of using white leather cord, I used a really light gold that kind of resembles white when it is in the light because I felt like it would look a little more classic without such a high contrast. I really like how it all turned out. I always think that Spring brings the most interesting weather. It is cold in the morning, then hot enough to wear your shorts in the afternoon. I love dressing in layers during Spring because I am able to take off layers as the day heats up. 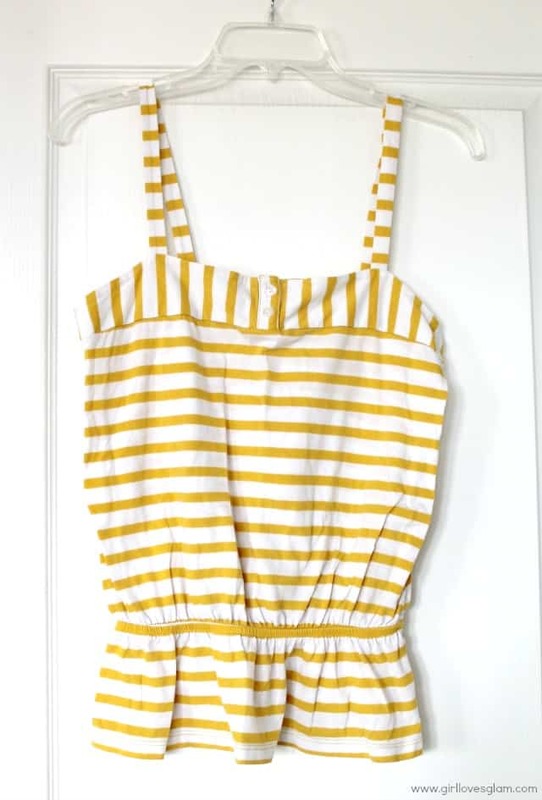 Layers are also a great way to add fun splashes of color to your wardrobe to really brighten up an outfit. My favorite way to layer up during the springtime is with a scarf! They are great because they can be any color or print and you won’t feel like you are being to wild with your outfit. They also can be made from so many different materials that make them easy to wear in any kind of weather. Scarves are even better when you can make them for free! 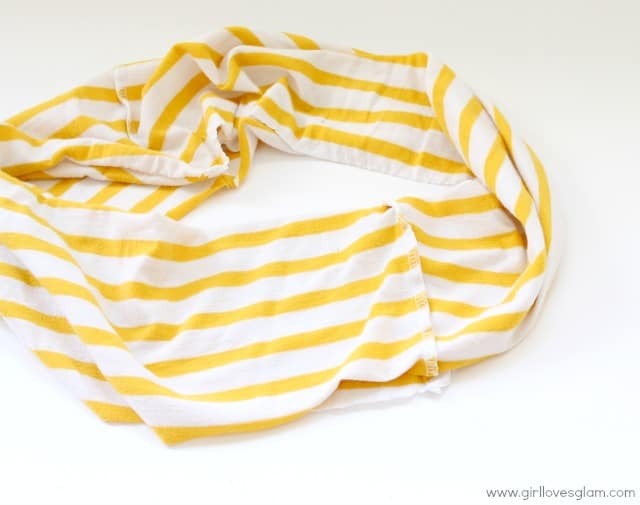 While you are spring cleaning, find an old T-shirt that you still love the color or print, but just don’t want to continue wearing as a shirt and turn it into your new favorite infinity scarf for the season! This is the shirt that I chose. I haven’t worn it for quite some time, but I still really loved the print and color of it. It was the perfect candidate for an upcycle! The first thing you want to do, is cut off the top and the bottom of the t-shirt. If you wanted to have a more edgy look to your scarf, you could end this tutorial here. The jersey knit won’t fray so you could have an edgy, unfinished look to your scarf if you wanted to. I don’t really recommend doing that if you have a printed fabric because you will be able to see the wrong side of the fabric with the faded colors on the inside of your scarf, but for a solid color, this would work out well. 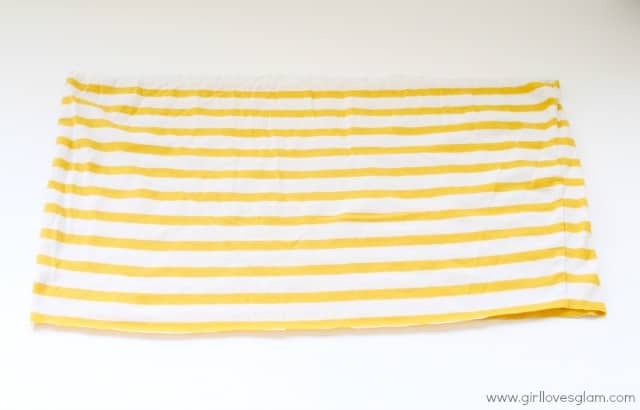 Fold the right sides of the fabric together and sew along the edge. Do this all the way around. 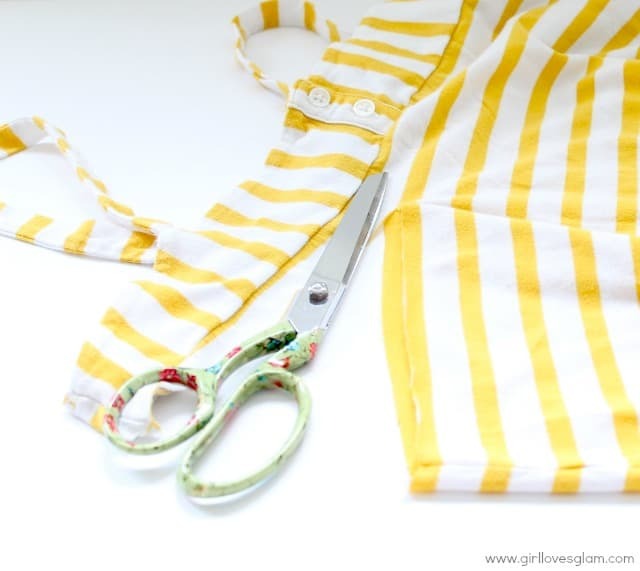 Cut your scarf along one of the seams from the shirt. Pull the scarf right side out. 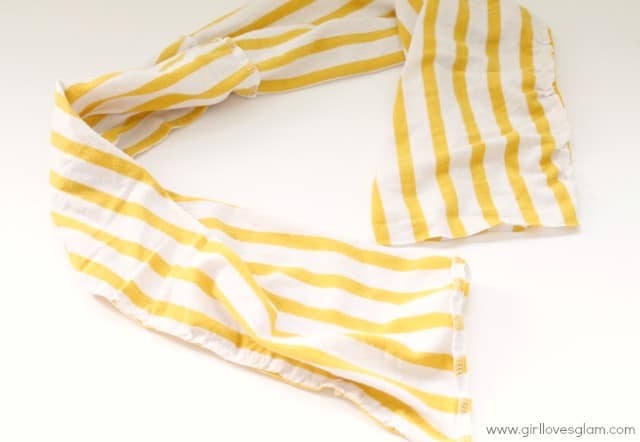 Fold scarf in half and pin the edges together. Then, sew a straight line across them to sew them together. Cut off any extra fabric off of that seam. 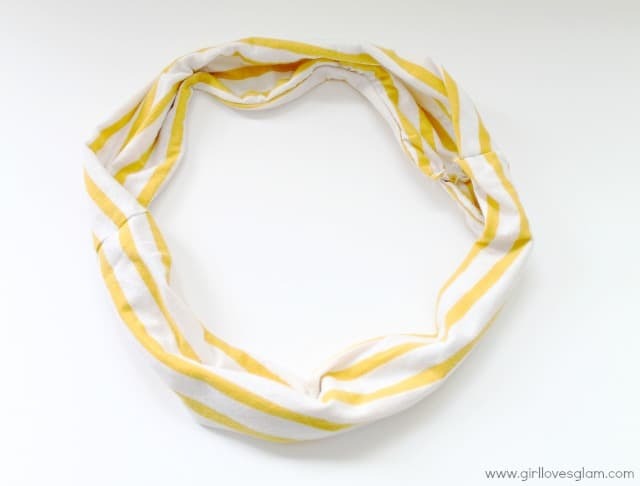 You could also do the hard way of sewing them together by pinning one side to the other side and then sewing in a circle around the edge of the scarf and finishing it off with a hand sewn seam, but I am all about quick, easy, and uncomplicated so I went with the easier route. 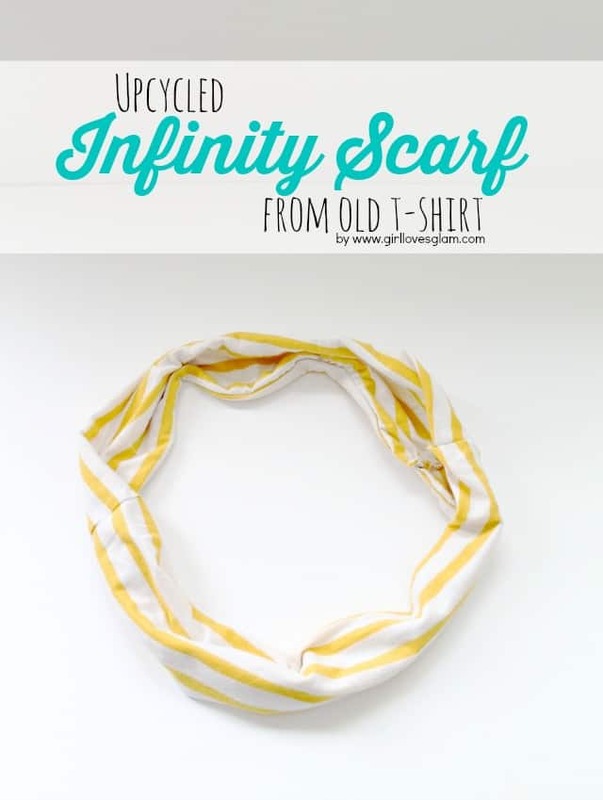 Now you have yourself a gorgeous new infinity scarf to wear this spring! I actually made mine for my daughter because I am totally in love with kids’ scarves right now. 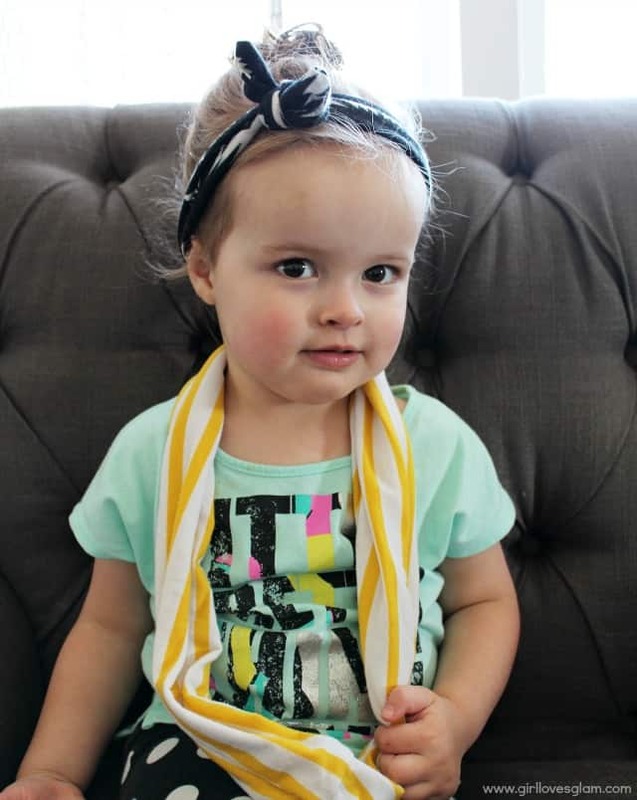 These scarves are so easy to whip up, you will be making them for the whole family! 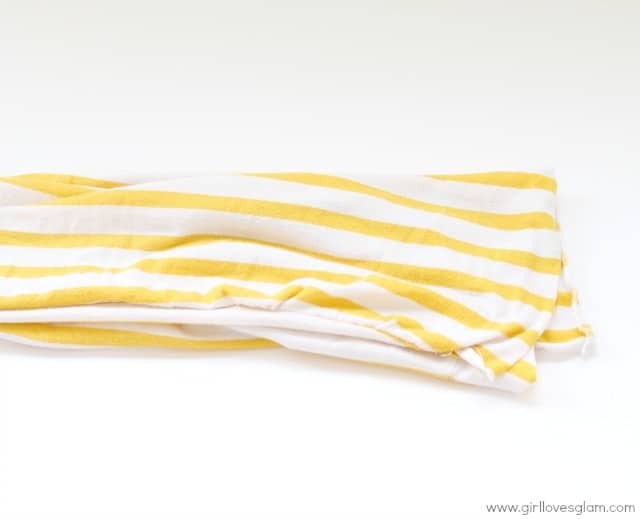 Now that you are a pro at making scarves, make sure to check out this tutorial to make two infinity scarves out of one yard of fabric too!